In some of the wait statistics data I’ve been analyzing, some servers have been showing very long ASYNC_IO_COMPLETION waits, which I had a hunch about but wanted proof. The official definition of ASYNC_IO_COMPLETION is ‘Occurs when a task is waiting for I/Os to finish.’ Very helpful – NOT! The third wait is for almost the full duration of the backup. As there are three of these per data backup, the per wait average will be a bit skewed. So there you have it. XEvents and a little internals knowledge let us understand what could otherwise be seen as a worrying high-duration wait type. Long-duration ASYNC_IO_COMPLETION waits commonly are from data backups (they don’t happen for regular log backups). One of the things that really frustrates me about wait statistics is that there is hardly any documentation about what the various wait types actually mean. For example, the Microsoft documentation for the WRITE_COMPLETION wait is ‘Occurs when a write operation is in progress.’ That’s not very illuminating. What kind of writes? Under what circumstances? There is a relatively easy way to figure out when particular wait types are occurring, using Extended Events to track the SQL Server code call stacks when the wait occurs. Also, this information and the methodology for it are required for quite a few of the people I’m working with to analyze their 24-hours of wait statistics (see this post). And in this post I’ll show you how to do these steps. Whenever an executable is compiled, you can optionally have the compiler generate symbols that can help with debugging. The symbols effectively correlate offsets in the compiled code with the human-readable names of code functions, class methods, and variables. This allows us to look at what’s called a call stack and figure out what SQL Server is doing. It lets us see at what point in the executable something happens, and we can make sense of the call stack if the words in there make sense in our context. You might be concerned that you don’t know the internals of SQL Server, but most of the time the names of the classes and methods have enough information for you to be able to work out what’s happening. We need the SQL Server symbol files for this to work. You can get them freely from Microsoft and I have a blog post with instructions to do it: How to download a sqlserver.pdb symbol file. If you have trouble with this, let me know as it can be tricky. Make sure your call stacks look correct – see the example in the ‘how to’ post. The Extended Event session to use is pretty simple. It uses the histogram target (called the ‘asynchronous bucketizer’ in earlier versions) so capture unique call stacks when the wait type we’re interested in occurs. One problem you may have is that some wait types aren’t listed by the name that shows up in sys.dm_os_wait_stats. Jonathan has a handy blog post that does the mapping for these – see here if you run the query above and don’t get a result. You MUST make sure to check the map value for your build, as it changes from release to release, including some service packs. If the trace flag isn’t enabled, the call stacks will not be resolved by SQL Server. The trace flag also pins dbghelp.dll in memory – don’t worry about it causing a perf issue. Note that there’s also a new Extended Event called wait_completed that was added in SQL Server 2014 – I’m using wait_info as it’s available in all versions with Extended Events. Now the Extended Event session exists, you need to run your workload. This may be just your regular workload, or a few example commands that you think may be involved. As an example, for the WRITE_COMPLETION wait type, I’ll do something simple like creating a database. Be careful: depending on the wait type you’re investigating, the Extended Event session may cause a small performance issue (e.g. a locking wait, CXPACKET wait, or PAGEIOLATCH_XX wait) so be prepared to stop the session. If you stop the session though, the information in the session histogram target disappears, so grab the data from it (see the Analysis section below) before stopping the session using the following code. But the longer you can run the session for, the more likely you’ll get the causes of the wait type you’re interested in. Now you have a method to investigate any wait type that you’re seeing in your workload. I’ll be posting a bunch of information about wait types and when they occur through the year. If you have call stacks that you’d like to know what they are, feel free to send me an email and I’ll respond within a week or so. What is the most worrying cause of log growth (log_reuse_wait_desc)? 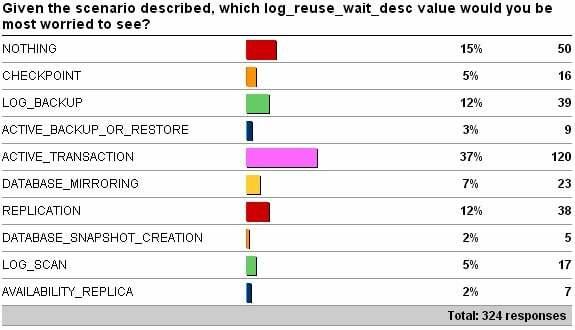 Two weeks ago I kicked off a survey that presented a scenario and asked you to vote for the log_reuse_wait_desc value you’d be most worried to see on a critical database with a 24×7 workload. Another very interesting spread of responses – as always, thanks to everyone who took the time to respond. Remember that you have no knowledge about anything on the system except what the log_reuse_wait_desc is for the database with constantly growing log. Before I start discussing them, I’m going to explain the term log truncation that I’ll be using. This is one of the two terms used (the other is log clearing) to describe the mechanism that marks currently-active VLFs (virtual log files) in the log as inactive so they can be reused. When there are inactive VLFs, the log can wrap around (see this post for more details) and doesn’t have to grow. When there are no available VLFs because log truncation isn’t possible, the log has to grow. When log truncation can’t make any VLFs inactive, it records the reason why, and that’s what the log_reuse_wait_desc value in sys.databases gives us. You can read more about how the log works in the this TechNet Magazine article I wrote back in 2009, and get all the log info you could ever want in my logging and recovery Pluralsight course. We also need to understand how the log_reuse_wait_desc reporting mechanism works. It gives the reason why log truncation couldn’t happen the last time log truncation was attempted. This can be confusing – for instance if you see ACTIVE_BACKUP_OR_RESTORE and you know there isn’t a backup or restore operation running, this just means that there was one running the last time log truncation was attempted. You can also see some weird effects – for instance if you do a log backup, and then see LOG_BACKUP immediately as the log_reuse_wait_desc value. I blogged about the reason for that phenomenon here. NOTHING: Just as it looks, this value means that SQL Server thinks there is no problem with log truncation. In our case though, the log is clearly growing, so how could we see NOTHING? Well, for this we have to understand how the log_reuse_wait_desc reporting works. The value is reporting what stopped log truncation last time it was attempted. If the value is NOTHING, it means that at least one VLF was marked inactive the last time log truncation occurred. We could have a situation where the log has a huge number of VLFs, and there are a large number of active transactions, with each one having its LOP_BEGIN_XACT log record in successive VLFs. If each time log truncation happens, a single transaction has committed, and it only manages to clear one VLF, it could be that the speed of log truncation is just waaaay slower than the speed of log record generation, and so the log is having to grow to accommodate it. I’d use my script here to see how many active transactions there are, monitor VLFs with DBCC LOGINFO, and also track the Log Truncations and Log Growths counters for the database in the Databases perfmon object. I need to see if I can engineer this case and repeatably see NOTHING. CHECKPOINT: This value means that a checkpoint hasn’t occurred since the last time log truncation occurred. In the simple recovery model, log truncation only happens when a checkpoint completes, so you wouldn’t normally see this value. When it can happen is if a checkpoint is taking a long time to complete and the log has to grow while the checkpoint is still running. I’ve seen this on one client system with a very poorly performing I/O subsystem and a very large buffer pool with a lot of dirty pages that needed to be flushed when the checkpoint occurred. You could also see this if the only checkpoint in the log would be lost if the log was truncated. There must always be a complete checkpoint (marked as beginning and ending successfully) in the active portion of the log, so that crash recovery will work correctly. ACTIVE_BACKUP_OR_RESTORE: This means that there’s a data backup running or any kind of restore running. The log can’t be truncated during a restore, and is required for data backups so can’t be truncated there either. ACTIVE_TRANSACTION: This means that there is a long-running transaction that is holding all the VLFs active. The way log truncation works is that it goes to the next VLF (#Y) from the last one (#X) made inactive last time log truncation works, and looks at that. If VLF #Y can’t be made inactive, then log truncation fails and the log_reuse_wait_desc value is recorded. If a long-running transaction has its LOP_BEGIN_XACT log record in VLF #Y, then no other VLFs can be made inactive either. Even if all other VLFs after VLF #Y have nothing to do with our long-running transaction – there’s no selective active vs. inactive. You can use this script to see all the active transactions. DATABASE_MIRRORING: This means that the database mirroring partnership has some latency in it and there are log records on the mirroring principal that haven’t yet been sent to the mirroring mirror (called the send queue). This can happen if the mirror is configured for asynchronous operation, where transactions can commit on the principal before their log records have been sent to the mirror. It can also happen in synchronous mode, if the mirror becomes disconnected or the mirroring session is suspended. The amount of log in the send queue can be equated to the expected amount of data (or work) loss in the event of a crash of the principal. REPLICATION: This value shows up when there are committed transactions that haven’t yet been scanned by the transaction replication Log Reader Agent job for the purpose of sending them to the replication distributor or harvesting them for Change Data Capture (which uses the same Agent job as transaction replication). The job could have been disabled, could be broken, or could have had its SQL Agent schedule changed. DATABASE_SNAPSHOT_CREATION: When a database snapshot is created (either manually or automatically by DBCC CHECKDB and other commands), the database snapshot is made transactionally consistent by using the database’s log to perform crash recovery into the database snapshot. The log obviously can’t be truncated while this is happening and this value will be the result. See this blog post for a bit more info. LOG_SCAN: This value shows up if a long-running call to fn_dblog (see here) is under way when the log truncation is attempted, or when the log is being scanned during a checkpoint. AVAILABILITY_REPLICA: This is the same thing as DATABASE_MIRRORING, but for an availability group (2012 onward) instead of database mirroring. Ok – so maybe not such a quick consideration of the various values :-) Books Online has basic information about these values here. So which one would *I* be the most worried to see for a 24 x 7, critical database? NOTHING: It could be the scenario I described in the list above, but that would entail a workload change having happened for me to be surprised by it. Otherwise it could be a SQL Server bug, which is unlikely. LOG_BACKUP: This would mean something had happened to the log backup job so it either isn’t running or it’s failing. Worst case here would be data loss if a catastrophic failure occurred, plus the next successful log backup is likely to be very large. ACTIVE_BACKUP_OR_RESTORE: As the log is growing, if this value shows up then it must be a long-running data backup. Log backups can run concurrently so I’m not worried about data loss of a problem occurs. ACTIVE_TRANSACTION: Worst case here is that the transaction needs to be killed and then will take a long time to roll back, producing a lot more transaction log before the log stops growing. DATABASE_MIRRORING: Worst case here is that a crash occurs and data/work loss occurs because of the log send queue on the principal, but only if I don’t have log backups that I can restore from. So maybe we’re looking at a trade off between some potential data loss or some potential down time (to restore from backups). REPLICATION: The worst case here is that replication’s got itself badly messed up for some reason and has to be fully removed from the database with sp_removedbreplication, and then reconfigured again. DATABASE_SNAPSHOT_CREATION: The worst case here is that there are some very long running transactions that are still being crash recovered into the database snapshot and that won’t finish for a while. It’s not possible to interrupt database snapshot creation, but it won’t affect anything in the source database apart from log truncation. LOG_SCAN: This is very unlikely to be a problem. AVAILABILITY_REPLICA: Same as for database mirroring, but we may have another replica that’s up-to-date (the availability group send queue could be for one of the asynchronous replicas that is running slowly, and we have a synchronous replica that’s up-to-date. The most worrying value is going to depend on what is likely to be the biggest problem for my environment: potential data loss, reinitialization of replication, very large log backup, or lots *more* log growth from waiting for a long-running transaction to commit or roll back. I think I’d be most worried to see ACTIVE_TRANSACTION, as it’s likely that the offending transaction will have to be killed which might generate a bunch more log, cause more log growth, and more log to be backed up, mirroring, replicated, and so on. This could also lead to disaster recovery problems too – if a long-running transaction exists and a failover occurs, the long-running transaction has to be rolled back before the database is fully available (even with fast recovery in Enterprise Edition). So there you have it. 37% of you agreed with me. I discussed this with Glenn just after I posted it and we agreed on ACTIVE_TRANSACTION as the most worrying type (so I didn’t just pick this because the largest proportion of respondents did).